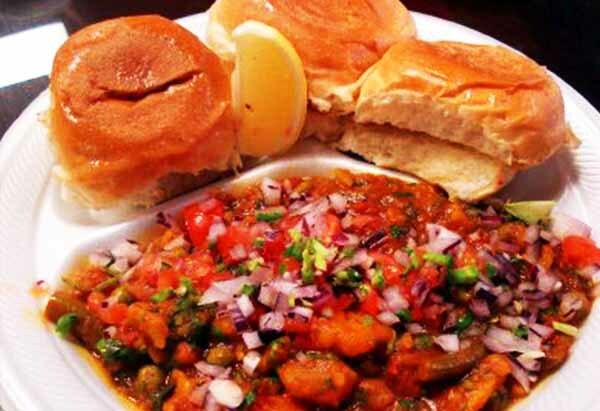 HOW TO MAKE PAV BHAJI ? Wash and boil the potatoes and peel them. Wash and cut all the vegetables into small dices. Add water to pressure cooker and add all chopped vegetables. Give 4-5 whistles to pressure cooker. Add oil/butter to the pan and heat it. Add ginger paste and let it sizzle. Add chopped onions to it until it turns golden brown in color. Add peas, salt and simmer it. Stir it and simmer it until oil seperates. Sprinkle some red chilli powder and stir on high flame. Add turmeric powder, salt, pav bhaji masala, red chili powder and finely chopped coriander leaves. Simmer it on medium flame . Grind boil vegetables and add it to the pan. Mix it and simmer it for 5-10 minutes. Cut buns from middle and fry it on tawa with butter. Heat some butter and take horizontally split buns and toast it on pan on medium flame. Preparation: First of all wash and cut all the vegetables into small dices. How to make Bhaji: Add water to pressure cooker and add all chopped vegetables. Add 1/2 tsp turmeric powder and salt(to taste). Give 4-5 whistles to pressure cooker. Meanwhile, let’s prepare tempering. Add oil/butter to the pan and heat it. Add ginger paste and let it sizzle. Add chopped onions to it until it turns golden brown in color. Add peas and simmer it. Grind boil vegetables and add it to the pan. Mix it well and simmer it 4-5 minutes. Add butter, finely chopped coriander leaves and juice of 1 lemon. Mix it well and simmer it for 6-7 minutes. Toasting Buns: Take a bun and split it into two horizontally. Add butter to tawa and toast bun on medium flame for 1-2 minutes. Buns are ready. Put it on the plate. Garnishing: Garnish the bhaji with butter and green chilies. Serve the pav bhaji with onions, coriander leaves and lemon. Also go for other Indian Chaat Recipe : Kulche chole, Chole Bhature, Pani Puri, Dahi Golgappe, Papdi Chaat. You can also take any seasonal vegetable. If you don’t have pav buns, use burger buns or bread instead.